South Bay’s oldest hospital, Paradise Valley Hospital finds its origins in 1904; when founder, Ellen G. White helped to purchase 54 acres of land to serve as the site of what would become the second oldest hospital in all of San Diego County and the largest employer in National City. 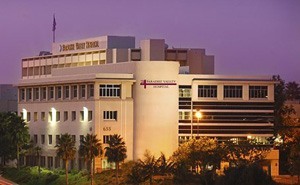 This 291-bed, acute care hospital includes the Paradise Valley Hospital Spine & Joint Center, a credentialed acute rehabilitation center, a Paradise Health & Senior Center, a fully equipped cardiac catheterization lab, comprehensive inpatient and outpatient surgical services, and 24-hour emergency services; along with a complete range of behavioral health and psychiatric services and preventative health services. Paradise Valley Hospital employs a multi-cultural staff of more than 300 physicians representing this spectrum of specialties. The hospital has won a whole host of awards, including a Top 100 Hospital in the Nation from Truven Health, a 5-Star honor for Cardiac, Critical Care, Gastrointestinal, Pulmonary and Orthopedic Conditions/Procedures Below from Healthgrades, and a Top Performer in Key Quality Measures honor from The Joint Commission. Dr. Payam Moazzaz is a resident spine surgeon at Paradise Valley Hospital, where he specializes in conditions that include back pain, scoliosis, kyphosis, degenerative disc disease, complex spine disorders, neck pain, prior failed surgery, sciatica, and select spinal trauma.